Duckenfield, Jamaica is a village in St Thomas, in south-east Jamaica. It is named after the sugar plantation on which it is located. 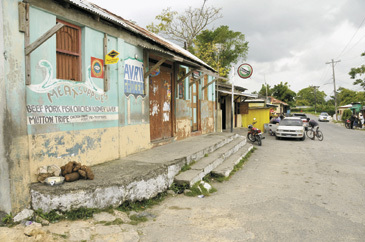 It is a very poor community, but it has grown substantially in recent years. There were plans to build an international airport in the vicinity in order to open the eastern end of the island to tourism, but these have since been shelved. The economy of Duckenfield is dominated by the nearby sugar estate and factory which are the only major employers in the vicinity. Any change in the fortunes of the sugar industry has an immediate and dramatic effect. There are two primary schools, Duckenfield Primary and Dalvey Primary. a hospital and a post office. ^ "Early Fall Newsletter 2008". Isaiahsixeight.org. 24 September 2008. Retrieved 11 September 2009. ^ Brown, Ingrid (29 January 2008). "Big tourism plan for eastern Jamaica". The Jamaica Observer. Archived from the original on 14 February 2009. Retrieved 11 September 2009. ^ Titus, Mark (20 March 2009). "$100m upgrade for Boscobel aerodrome - Duckenfield idea shelved, Ken Jones bypassed". The Gleaner. Kingston, Jamaica: The Gleaner Company Ltd. Archived from the original on 8 May 2010. Retrieved 29 October 2012. ^ Brown, Ingrid (6 February 2009). "Saint Thomas Jamaica W.I." St Thomas Jamaica WI. Archived from the original on 9 March 2009. Retrieved 30 March 2019. ^ "Mean Climatological Data" (PDF). Meteorological Service (Jamaica). Archived from the original (PDF) on 16 September 2012. Retrieved 7 September 2016. ^ "DUCKENFIELD PRIMARY SCHOOL SAYS 'THANK YOU DIGICEL FOUNDATION'". Digicel Foundation. 23 January 2009. Retrieved 11 September 2009. This page was last edited on 30 March 2019, at 20:18 (UTC).